On the first day of the NCAA finals, three Ivy Leaguers had their best appearances yet at a NCAA championships while one first-timer earned the opportunity to compete in one of Friday’s finals. Cornell’s Rudy Winkler has improved immensely since this time last year. In the 2015 hammer throw finals, he finished eighth overall with a best distance of 223-05 to earn First-Team All-American honors. 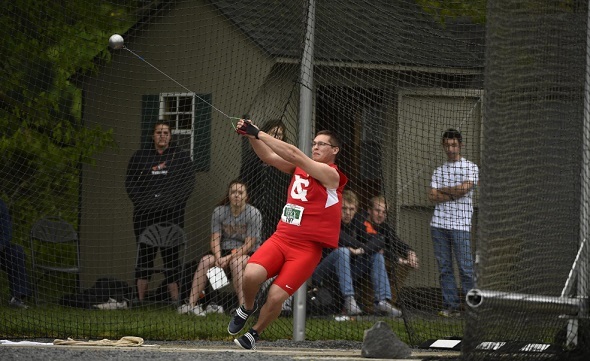 Today, he bettered his 2015 distance four times as he finished second overall in the hammer throw with a distance of 239-00. Winkler’s second place finish is the best finish by an Ivy League undergraduate since 1970 when Dartmouth’s Dewitt Davies finished as the runner-up with a distance of 195-08. Oklahoma State’s Nick Miller won the event with a 242-08 mark. Princeton rookie Adam Kelly earned Second-Team honors with a 14th place finish as his best distance was 215-11. Princeton’s Adam Bragg had a very clean start in the pole vault finals. He easily cleared the first two heights in the competition – 5.15m, 5.30m – and he entered the height of 5.45m (17-10 ½) as one of six athletes with no misses yet in the competition. Unfortunately, Bragg did not clear 5.45m and he had to settle with a 5.30m (17-04 ½) performance. But the good news is that Bragg finished in a tie for 7th place – good enough for First-Team All-American honors, a first ever for Princeton in the pole vault. This was a better performance for him than in 2014, where he finished in 12th place at a height of 5.10m to get Second-Team honors. Cornell’s Rob Robbins looked to improve his 2013 NCAA finish in the javelin throw, where he just missed First-Team honors with a ninth place finish with 229-11. Well after the first three throws, Robbins was in eighth place with 237-11 and earned the opportunity to throw three more times. He did not improve his mark in his final throws. He finished in eighth place with a distance of 237-11, First-Team honors for Robbins in the javelin. HepsNation had two entries in the men’s 1,500m semifinals, only one will advance to Friday’s final. The top 5 in each heat automatically advanced while the next two fastest non-auto times earn the final spots. Cornell’s James Gowans was in the first semifinal heat and was among the leaders for the first 1100m, co-leading with Utah State’s Dillon Maggard. But the slow pace led to a lot of pushing among the athletes and that final lap favored those with the kicks. Gowans is also a strong 800m runner and did his best to stay in auto-contention but his kick wasn’t strong enough as he finished eighth in his heat with 3:51.59 and outside of any consideration for the finals. The second semifinal heat was significantly faster as the crew went out on sub-4 min/mile pace and Yale’s James Randon settled near the back of the pack at the end of the first lap. Randon slowly moved up on the field, sitting in seventh place at the bell. Fortunately for Randon, he did not let anyone pass him on that final lap and managed to earn the final time qualifier with a speedy 3:41.22. Only two other Ivy Leaguers have ever finished in the top 8 in the men’s 1,500m – Princeton’s Bill Burke in 1991 and Dartmouth’s Ben True in 2007 – can Randon become the third? Other HepsNation results from the track include Brown alum Jordan Mann (now running for Providence College) in the steeplechase and Cornell senior Max Hairston in the high hurdles. Mann finished seventh in his semifinal heat and 15th overall in 8:48.05 to earn Second-Team honors. Hairston ran 13.87 into a slight headwind to finish sixth in his semifinal heat, but it wasn’t enough to advance to the finals on Friday. His time was the 19th fastest in the field. The women’s action will begin tomorrow at 3:30pm ET. You can watch the action online through ESPN3.com or check your cable listings on when and which ESPN affiliate they will be showing the meet. This entry was posted on Wednesday, June 8th, 2016 at 10:02 pm. It is filed under Athletes, Spotlight. You can follow any responses to this entry through the RSS 2.0 feed.